It’s kind of ironic that the film I was most excited to see at the Athena Film Festival was about books! About a month before the festival, I read The Left Hand of Darkness for the first time and was struck by the worldbuilding Ursula K. Le Guin put into her planet of genderless people. Our own society is built on the duality of male and female, and you can see that in everything from our cultural practices to our scientific gaze—everything we encounter, we project dualities onto it, and where there are none, we create them. Le Guin creates a world as fundamentally based on the assumptions of the planet Gethen’s society as Earth’s society is based on our own! This is all to say that when I looked at the Athena Film Festival’s schedule and saw The Worlds of Ursula K. Le Guin was showing on Friday night, I immediately marked it as a must-watch. The film presents us with the story of a woman who started out in her own time and promptly jumped about a thousand years into the future. Le Guin was critiquing the treatment of Native Americans by whites before indigenous activism was at all part of the white mainstream (indigenous activism has of course always been part of the cultures plundered by white settler-colonial societies). Le Guin also brings a robustly developed anarchist philosophy to her mid- to late work, penning The Dispossessed as an examination of how a society without government could work, and also how a society on the moon could work. Two birds with one stone! The audience watching Worlds of Ursula K. Le Guin with me was about as excited as I was, since I guess you don’t go to a documentary about the most important woman sci-fi writer of the 20th century if you don’t like her work! There were also interviews from big-name authors like Neil Gaiman, Margaret Atwood, and David Mitchell, who have all been inspired by Le Guin’s work. As they speak we see Le Guin’s books animated for us in a mesmerizing style—Le Guin’s stories come to life through streaks of paint that flow through the characters and settings of her books using stop-motion. As I watched this brilliant woman’s ouvre progress through her works, I thought that this film would certainly be the most inspiring thing I saw at the Athena Film Festival. However, I was wrong! Dykes! Camera! Action! is a firey history of 1970s lesbian filmmakers, moving through history to the present day’s more mainstream lesbian representation in film. The whole audience in the theater was clearly made up of queer women, as evidenced by the big laughs at certain jokes that a straight audience would never have noticed. It was great to see queer women being included in the Athena Film Festival, since too often feminism leaves behind women who are not white, straight, and cis. There was a robust and diverse crowd at this film that made me more hopeful for the future. However, a question of mine that was not fully answered at the Q and A afterward was how the filmmaker Caroline Berler saw queer film developing now that Hollywood studios seem to be including queer people in their big-budget movies. My point was that I find “queersploitation” films like Love, Simon (among others) to be an undermining of the queer community’s challenge to Hollywood’s traditional ways of seeing. Berler didn’t seem to quite catch my drift, though a Barnard student sitting next to me did—after we left the theater she, Farah, and I talked about how capitalism and heteropatriarchy enforce each other, and the need for queer people to stay radical in the face of media companies that would buy our complacency by throwing us a bone every now and then. I have a major problem with mainstream queer movies. For one thing, the queer people in movies do not look like the queer people I know in real life. This connects to the larger issue of people in movies not looking like people in real life. The aesthetics aren’t even the real problem, though—queer movies basically just take straight tropes and flip the gender of one of the partners! Queerness is supposed to be a challenge to those tropes, not just one more set of identities that can be shoehorned into them whenever Paramount sees a new community they can make $20 in ticket money off of. Frankly, I find it predatory for the media in this country to systematically exclude queer people from its stories for so long and then immediately jump into the Pride Parade now that queer people’s human rights are profitable. Anyway. I loved Dykes, Camera, Action’s survey of lesbian cinema, and I certainly got some good titles to add to my watch list. Being queer is weird, because instead of being raised in a cultural tradition like with one’s ethnic group or nationality, one has to seek out one’s culture and figure out how to join it. For instance, a queer person who hasn’t been part of the scene for very long is referred to as a “baby gay,” because you literally have to figure out how to be a person all over again. All the filmmakers in Dykes, Camera, Action had been through that, just like me and the rest of the audience at the screening. From what I heard from other FF2 reviewers, we all found a piece of community like that at Athena, which is why we all rode the train for an hour and a half to get there. All in all, I would gladly ride that train for an hour and a half again! 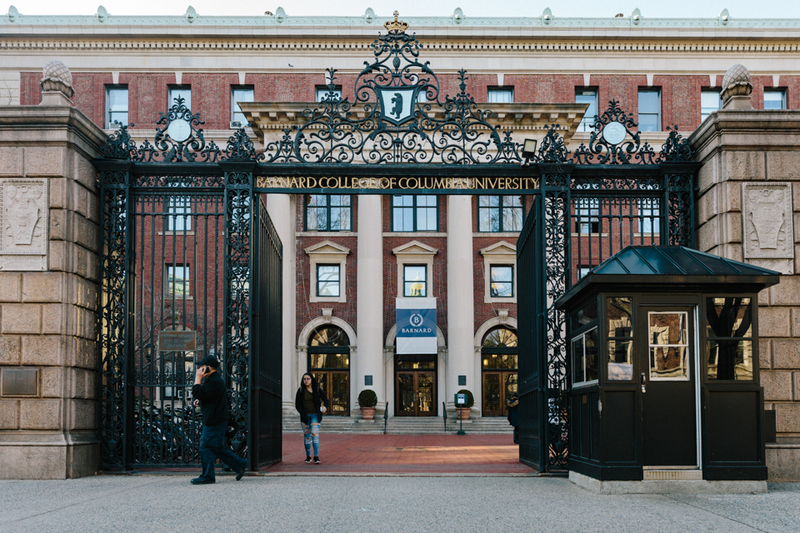 Featured Photo: The Barnard campus, where the Athena Film Festival took place. Photo Credit: Columbia Daily Spectator.